Well the temperatures have certainly soared this last little while and as I write this it is 33C outside. 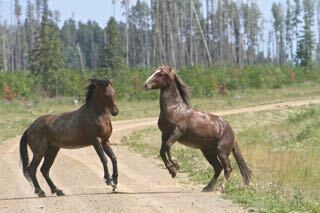 The Alberta Mountain Horses (wild) do feel the heat and seek many avenues in order to escape it and the constant nuisance of the swarming insects. One method some of the horses use is to find a muddy body of water and they then roll and splash in it to give themselves a protective coat of mud. 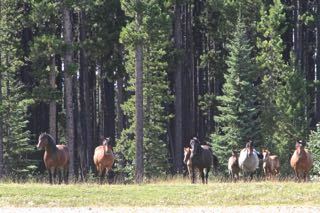 Another unique behaviour of the horses this time of year is that several herds gather together in close proximity. This is usually in the areas that over the years they have found offer them the most effective relief. 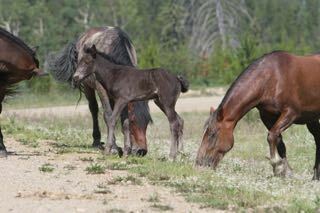 This year we have counted one group of over 70 horses and the other of 50. The interaction between the stallions and the herds is fairly friendly with only minor conflicts between the herd stallions. Included in the gatherings are usually a number of young bachelor studs. Usually they hang out together but on occasion an up and coming stallion will try his hand at taking on a mature herd stallion. Here a young boy who just finished his refreshing mud bath, is challenging another. Almost all these altercations are just show and bluff with no injuries being sustained. Do you wonder where all the horses are? 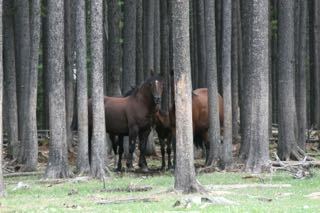 In the recent heat wave and in fact every summer, the horses will retreat into the timber for the obvious reasons. The areas they choose are usually more open which offers clear site lines, the ability of the breezes to blow through, and yet plenty of shade. Here they will stand head to tail for most of the day expanding very little energy in the heat. If the winds are up the horses will find very exposed areas like hilltops and roadways where the insects tend not to be as bad. 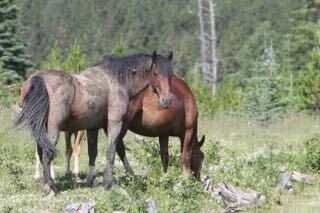 This mature stallion has taken advantage of a mud bath and now the open meadow to stand close to his mare and foal. The heat and the bugs can be extremely hard of the young ones who do not yet have the long tails to swish away the bugs. They then crowd around mom to seek relief. In this area we have been fortunate to have a fair number of thunder and rain storms roll through the foothills. 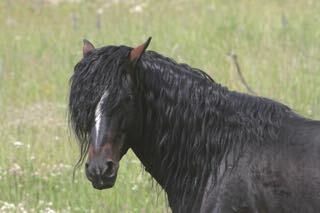 This mare with unique facial markings enjoys the cooling effect of the rain. 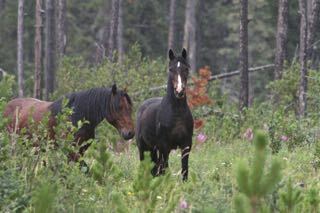 These storms have also kept the grass green and lush through the Alberta Mountain Horse range. 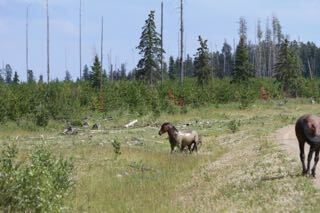 In a remote valley we found this stunning stallion all alone with no there horses that we could see within miles of him. He so typifies the rugged beauty and uniqueness of our horses. He was so unafraid and sure of himself that we could get close-up pictures. 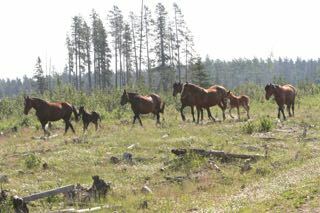 So if you are out in the forest looking for horses, it is best in the early morning or at dusk to find them. Soon though when the weather starts to cool again, they will tend to spread out and become a little bit easier to find in your travels. On Sunday, September 20, WHOAS is hosting a volunteer appreciation event. It will be held at our facility from 11 a.m. to 3 p.m. So for all of you who came out to help the horses that we rescued, we welcome you to attend. Please send an email to WHOASalberta@gmail.com to let us know if you can come. That way we can plan enough food for all. So good to see you write this. Through your stories are the only way now that I can see how the wild horses are doing. I don’t get out much any more. Hello, and thank you for all you do for these magnificent creatures. My daughter Skye is passionate about horses, and about the preservation and care of wild horses. She has been asking if we can try to see them and I don’t have a clue where to start. Is there an area you can recommend? A time of year? A time of day? Thanks for helping to make a 10 year old girl’s dream come true!